This page was originally written as a bonus "Easter Egg" page, whereby readers could click on a small, virtually unnoticed link in one of the other articles that would bring them here. The new design doesn't allow for "hidden" pages, so it's now an article in its own right. Sadly, there wasn't much written regarding this topic, which was basically just a rating of the solo Human Torch stories in Strange Tales, along with the story titles and the authors/artists. Originally a monster anthology book beginning in June 1951, it began to include superheroes during the 60s, and the Torch was the first FF member to be given the honour of solo strips. The first seven issues were notable for being written by Stan Lee's brother, Larry, and Stan plotted every single one of them, save for #132, which was the sole work of Larry Ivie. While it seems strange that Stan would pick Johnny over the Thing as the solo star, Ben did feature as a regular guest star from #123, and made so many cameos that if you count the flashback appearance (#122) and painting replica (#108) there's only 10 of the 35 strips that Ben didn't manage to feature in. Reed and Sue also put in appearances for 25 and 26 issues respectively, with Sue housesharing with Johnny in Glenville for the duration. It all lasted until #135, when Nick Fury took over from the Torch and Doctor Strange (who first appeared as the secondary strip in #110) took over as the main attraction. Sadly, even by early FF standards these stories (Oct '62 - Jul '65) are agonisingly unsophisticated, and see such bizarre quandaries as the Torch trying to keep his secret identity(! ); taking a full rock-hard punch to the back of the head from the Sandman and surviving; and dating Doris "Dorrie" Evans, a girl who was referenced a number of times in the FF comic to baffling effect as she never crossed over to it at the time. 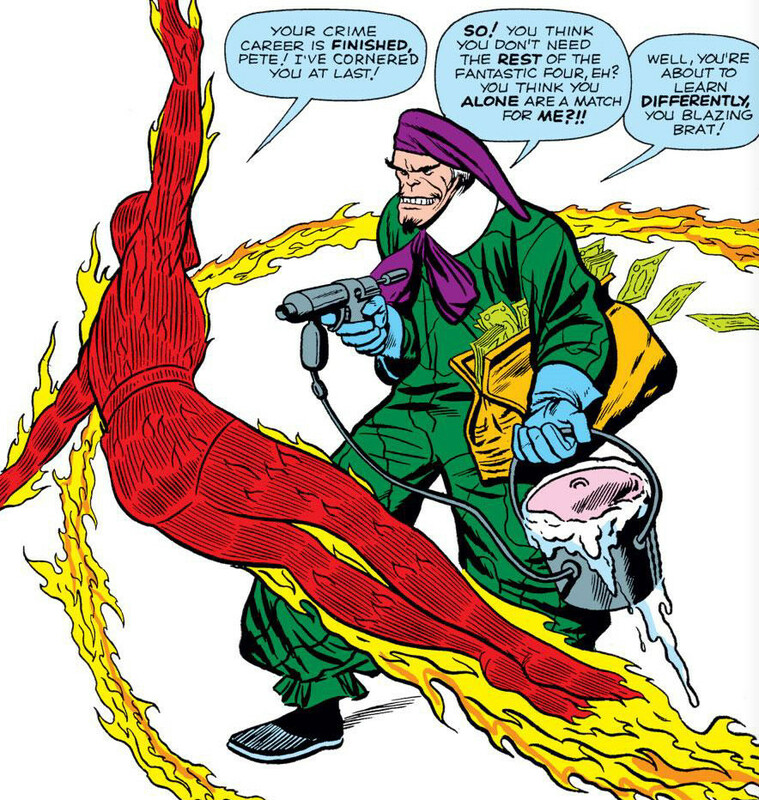 More significantly, it saw the debut of the Wizard and the Trapster (then called Paste Pot Pete) and, although the Sandman was first introduced in an issue of The Amazing Spider-Man, his first encounter with Johnny is seen here. Sadly, In terms of quality, then while very few of the issues are outright poor, it's a very mediocre strip, full of scrappy art and only two issues above average. Some of them actually need to be read in order to fully understand the FF stories, but it wasn't a patch on the parent title. Thirty five stories, then, and seventeen feature hirsute villains, with even the original Trapster sporting mid-length hair and a goatee.The Wizard initially turned out to be an incredibly dull character, a freakishly long faced genius who sought to intellectually best the Torch with parlour tricks. His debut was in #102, while #110 saw him meet Paste-Pot Pete for the very first time. #118 is perhaps the most important of these related issues as it leads directly into his plight in FF #36. However, the Wizard's second appearance in #105 can be safely avoided without missing any important continuity points, as can his one-panel cameo in #112. Paste Pot Pete is a different matter entirely. Looking like a cross between one of the cartoon cereal men from Rice Krispies and a dandy decorator, he's one of the most hysterically bad Marvel villains ever. 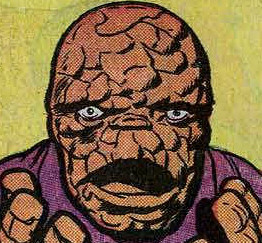 His debut in #104 is a cult classic waiting to happen, while #124 shows off his new look and his fear of The Thing. If you want to get really pedantic, then both of them feature in the form of one-panel flashbacks during #127. As for the Sandman, as stated his initial Marvel appearances were Spider-Man related. His debut was in Amazing Spider-Man #4 (***), though for his second appearance he did cross over to menace the Torch in Strange Tales #115. Pre-evil FF he returned with Spider-Man in Annual #1 (****) and #18 (****) actually featuring cameos by the FF. Even though they're continuity inessential reads and the Annual has the crassest cross-title plugs I've ever seen, they're well worth a read. Finally, the last pre-FF #36 edition for Sandy was The Amazing Spider-Man #19 (****), which included a high-profile guest role for the Torch and the prophetic line from Johnny "Count your blessings, mister! What if you had my three partners, also?"